Mary Hill’s Legacy webinar “Land Records Solve Research Problems” really solved my research problem! Mary did a superb job of explaining the various terms used in land records, the differences in assorted types of mortgage transactions, and how this info can help you in your family history. Probably the most important tidbit I picked up was how records pertaining to multiple individuals (i.e., “et al”) are some of the most important records, as they may contain clues about relationships of the people listed and are often the most helpful in our research. 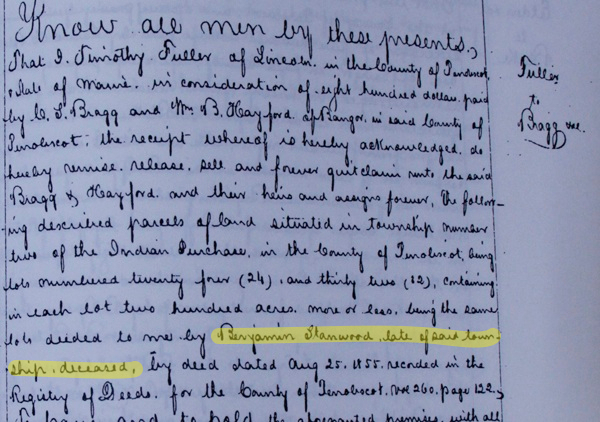 Armed with this knowledge, this past July while visiting the Penobscot County (Maine) Registry of Deeds I spent the bulk of the day happily researching the transfer of Benjamin Stanwood’s three lots located in Northern Woodville as they passed from hand to hand. That evening, back at the hotel, I drew a diagram showing the names and dates of grantors/grantees, trying to see a pattern. Benjamin often mortgaged the property, and the mortgages were frequently sold. The property always ended up back in family hands (you can read here about finding my fourth cousin who currently resides on the property), but I wanted to try and connect each sale through the land records. Some may have considered it a waste of time (why does it matter that that property was mortgaged with a sale to Hayford but mysteriously purchased back from Swett?) but I was determined to trace it’s passing from hand to hand whenever possible and headed back to the Registry of Deeds the next morning to try and find the missing link. THANK GOODNESS I DID!!! Deed referencing the late Benjamin Stanwood, dated 12 October 1860. Finally, I now had an answer to a very old question, made challenging to solve using typical avenues due to the destruction of Woodville’s town records by fire many years ago. Was Benjamin’s absence on the 1860 census indicative of his death? YES! Did Benjamin die before the family moved to Minnesota in 1867? YES! While I still do not have an exact date of death for my ancestor, at long last I know he died in Maine sometime between May 1857 (his last recorded land transaction) and October 1860, and his family would have been struggling through the ensuing Civil War years without his support and income. This further explains some of the troubling decisions made by his granddaughters, who found themselves widowed when their husbands died during the war, and who sent their young sons midwest to live with other family members. Yes, I agree with Mary Hill – land records can solve a host of genealogical problems! This entry was posted on Saturday, August 31st, 2013 at 3:56 AM	and posted in Research Trips, Stanwood, Uncategorized. You can follow any responses to this entry through the RSS 2.0 feed. « Sleuthing, serendipity and magical Maine maps!